One aspect of Irish railway history which has received scant attention over the years is that of the carriages which ran on the country’s broad gauge tracks. Desmond Coakham was one of the few observers of Ireland’s railways in the 1950s and 1960s, who photographed what the locomotive was pulling, as well as the locomotive itself. 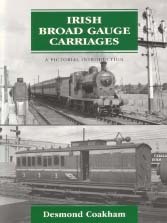 Starting with survivors from as early as the 1840s and 1850s, he describes and illustrates a wide range of carriages, vehicles representing virtually every Irish railway company, up to the present day. The book will fascinate all those interested in the development of the railway carriage over the decades. It will also be a wonderful reference source for railway modellers as well as opening a window on a neglected but intriguing aspect of the railway history of these islands which has hitherto gone largely unrecorded.